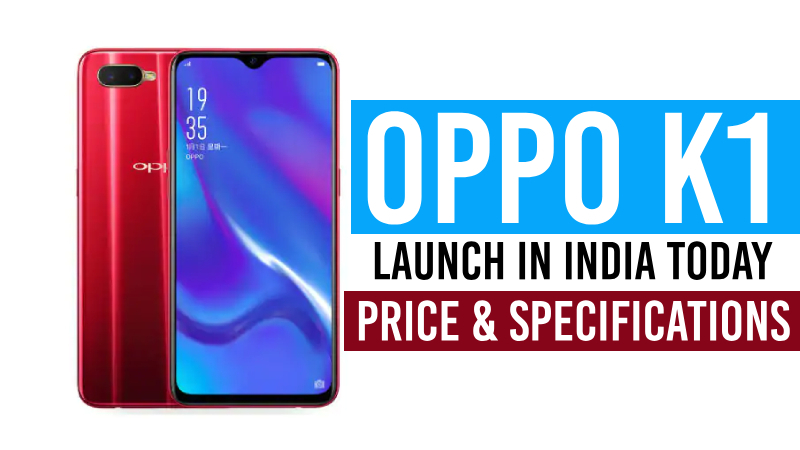 Today, Oppo is set to launch its smartphone Oppo K1 in India. The Chinese smartphone maker hosts a press event in New Delhi, where the smartphone will be unveiled. The event will begin at 11:30 IST. Earlier, the e-retailer Flipkart, who will carry the phone, used a microsite on its website to tease the launch. The teaser notes that the phone will have a fingerprint sensor on display and will be released for an "incredible "price. The phone is offered in the home market of the company starting at CNY 1,599 (about Rs. 17,100). The Oppo K1 was originally introduced in China in October 2018 and is based on Android 8.1 Oreo on ColorOS 5.2. The phone has a full-HD + display of 6.4 inches (1080x2340 pixels) with a 19.5:9 aspect ratio and a 91 percent screen-to-body ratio. The octa-core Qualcomm Snapdragon 660 processor is powered by clocking up to 2.2GHz. The Oppo K1 is available in 4 GB RAM and 6 GB RAM variants and the same variants are expected to be available in India. The Oppo K1 packs a two-camera setup on the back with a 16-megapixel primary sensor and a 2-megapixel secondary sensor in terms of image capabilities. There's a 25-megapixel selfie camera on the front. The Oppo K1 comes with an integrated storage capacity of 64 GB, which can be expanded via a microSD card (up to 256 GB). Options for connectivity include 4 G VoLTE, Wi-Fi I 802.11 a / b / g /n / ac and Bluetooth 5.0. The smartphone comes with a fingerprint sensor on display and has a 3D glass back. The Oppo K1 packs a battery of 3,600mAh under the hood. 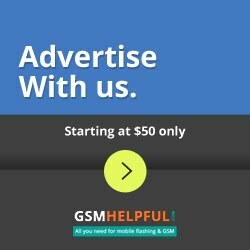 Since the launch is scheduled for today, the company has yet to reveal the phone's official pricing, but the Chinese phone price does provide some insight into what we can expect the phone to be priced. 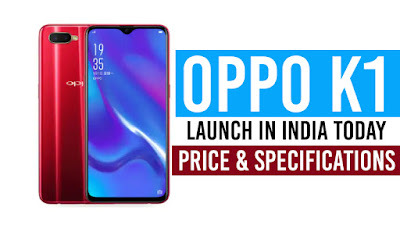 The Oppo K1 starts in China at CNY 1,599 (approximately Rs. 16,900) for the 4 GB RAM variant, while the 6 GB RAM model is priced at CNY 1,799 (approximately Rs. 19,000). We expect the Indian market to be priced similarly. In addition, the Oppo K1 offers two color gradient options in its home market, namely Mocha Red and Van Gogh Blue. Both options are likely to arrive in India.